In 2001, Red House Painters quietly dissolved, with Koutsos, Vessel and Carney continuing to record and perform with Kozelek under his new guise Sun Kil Moon until 2010. Between September 1992 and March 1995, the band released three LPs, one double LP, and one EP. Their first 4AD release was an album made up of demos entitled Down Colorful Hill. 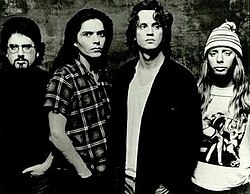 In 1993, the group came out with two self-titled records (now commonly referred to as Rollercoaster and Bridge because of their cover artwork). In early 1994, they released an EP entitled Shock Me, featuring two cover versions of an Ace Frehley-written KISS song. The introspective Ocean Beach followed in spring 1995. Founding guitarist Gorden Mack left shortly after the album's release, and he was replaced shortly thereafter by Phil Carney. Phil Carney occasionally accompanies Kozelek on tour dates, playing second guitar. Drummer Anthony Koutsos is also a real estate agent in San Francisco. Musically, the band's sound has been described as folk rock, sadcore, slowcore, indie rock and alternative rock. ^ a b c d Strong, Martin C. (2000). The Great Rock Discography (5th ed.). Edinburgh: Mojo Books. pp. 805–806. ISBN 1-84195-017-3. ^ O'Connor, Rob (April 2010). "An Interview with Mark Kozelek of Sun Kil Moon". Caldo Verde Records. Retrieved April 1, 2012. ^ a b "FTWW". Fedge.net. Retrieved 2015-08-11. ^ "Album By Album : Mark Kozelek" (PDF). Sunkilmoon.com. Retrieved 2015-08-11. ^ "Mark Kozelek". IMDb.com. Retrieved 2015-08-11. ^ "Anthony Koutsos". Anthony Koutsos. Retrieved 2015-08-11. ^ Hawthorne, Marc (2006-05-10). "Mark Kozelek · Interview · The A.V. Club". Avclub.com. Retrieved 2015-08-11. ^ Mulvey, John (September 12, 2005). "Red House Painters : Old Ramon". NME. Retrieved July 15, 2015. ^ McKeating, Scott (July 27, 2011). "A Quietus Guide To The Work Of Mark Kozelek". The Quietus. Retrieved July 15, 2015. ^ a b Hawthorne, Marc (September 25, 2007). "Red House Painters: Red House Painters". The A.V. Club. Retrieved July 15, 2015. ^ "Sadcore". Allmusic. Retrieved July 15, 2015. ^ BBC Radio 6 Music's Alternative Jukebox: 500 Extraordinary Tracks That Tell the Story of Alternative Music. Hachette UK. 2014. p. 178. ISBN 1844038149. ^ Battersby, Matilda (June 5, 2015). "Mark Kozelek of Sun Kil Moon calls female journalist 'a b***h' in front of 1,900 people". The Independent. Retrieved July 24, 2015. ^ "Mark Kozelek announces new Sun Kil Moon album entitled Benji to be released early 2014". Fact. September 25, 2013. Retrieved July 24, 2015. This page was last edited on 22 December 2018, at 07:49 (UTC).